On a warm Wednesday evening this week, Kathleen Downey handed a maraca to each of two men who were seated in chairs in a sunny lounge in a group home operated by the Department of Developmental Services in Clinton. Melody and rhythm immediately worked a change on the room. Where there had been silence and stillness, everything now seemed to pulse with movement and sound. A little ukulele can have big effect on a small room. For the past 15 years, Downey, a music educator and therapist, has been playing and singing to residents of the Templeton Developmental Center in Baldwinville and in both state and privately operated group homes for the intellectually disabled, including the Clinton facility. 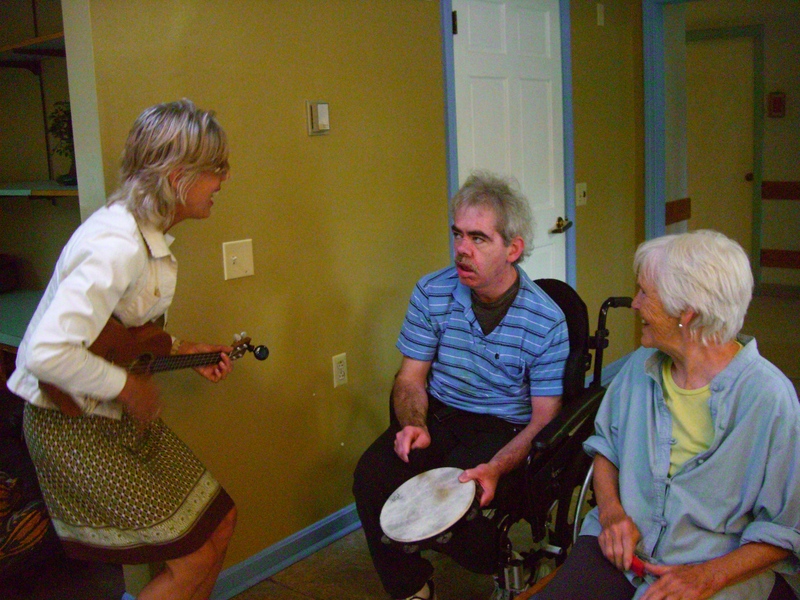 Paul Frain (center), a resident of a DDS group home in Clinton, helps out with the rhythm as music therapist Kathleen Downey (left) sings “Sugar in the Morning” Wednesday. At right is Paul’s mother, Maryalice Frain. From Downey’s first song onward on Wednesday, one of the men with the maracas shook it and smiled. Maryalice Frain, the mother of Paul Frain, a resident who had not yet arrived from his bedroom, tapped a set of spoons. Another resident waved his arms to the beat. A member of the group home staff danced in the middle of the seated circle of residents and engaged them one by one. For Downey, the tapping, singing, and waving was a sign that her music was having its intended effect. A man named Walter didn’t want to participate in the music session at first. “I want to go to bed,” he said. Downey, walked up to him while strumming the ukulele and gave him a big smile. “Welcome, Walter,” she said. Immediately, his frown softened and he started waving his arms in time. “I do it with compassion,” Downey says of her work. Trained in music education at the Berklee College of Music in Boston, Downey also works with Alzheimer’s patients in nursing homes. She is about to launch a program, called AlzAlive, that uses music, movement and touch to improve the lives of people battling that disease. No matter the setting, she says, the music has a similar effect. “People become more communicative, more relaxed, more self confident,” Downey says. “Their stress level goes down.” The change is noticeable over the course of the hour, but it is also noticeable over a longer period of months and years. Paul Frain, who arrived in a wheelchair pushed by an attendant about five minutes into the session in Clinton, is a case in point. “It’s Lenny’s turn to sing,” Downey said next, turning toward one of the men to whom she had handed a maraca, but who had at first shown no reaction to it. “Do you want to do ‘I’ve Been Working on the Railroad,’ or ‘Take Me Out to the Ball Game?’” she asked him. “Ball game,” Lenny answered. And the song began. Downey next reached for a guitar and started singing “If I Had a Hammer” and then “Working on the Railroad,” and it was as if a loud party had been going on in the small room. She strolled across the middle of the circle as she sang. “Someone’s in the kitchen with Walter,” she sang to him. Walter started clapping in time. Guitar still in hand, Downey next sang “This Land is Your Land,” then “Jambalaya,” and then a soulful rendition of “Good Evening Blues,” which Paul helped bring to an end with some strong drumming on the tambourine. “We should take this on the road,” Downey said to him. Afterwards, Paul pronounced it to have been a good session. What was his favorite tune? “This Land is Your Land,” he said. More information about Downey’s music therapy for the intellectually disabled and people with Alzheimer’s can be found on her website at www.miracle-moments.com. Her email contact is justgrand@msn.com. The state Department of Developmental Services is proposing changes to its regulations that we believe will take away guardian and family rights and water down the scope of services that are listed in individual clients’ care plans. We at COFAR view these proposed changes as an attempt to reverse critically important gains made by the intellectually disabled and their families and guardians in Massachusetts from the 1970s through the 1990s. We’re joined in our concerns by the Wrentham Association, a COFAR member organization and one of the original plaintiffs in the landmark Ricci v. Okin federal consent decree case that upgraded care of the intellectually disabled in Massachusetts. In written comments submitted to DDS last week, the Wrentham family group maintained (and we concur) that the proposed changes to the regulations would violate the historic 1993 Disengagement Order in the Ricci case of U.S. District Court Judge Joseph Tauro. As the Wrentham Association letter noted, the Disengagement Order requires DDS “to continually evaluate the needs of each individual class member and to develop strategies to address those needs.” Several of the proposed changes to the DDS regulations “would substantially dilute” client care plans, known as Individual Support Plans or ISPs, and would exclude or limit family participation in the ISP process, the letter stated. The ISP process is fundamental to the provision of adequate supports and services to some of the most fragile and vulnerable members of our society…The protection of the rights of the individuals, family members, and guardians involved is central to the ISP process and the Disengagement Order. We therefore strongly oppose efforts to begin chipping away at those rights, as the proposed regulations appear to do. Among the key proposed changes by DDS is the elimination of the requirement that services be listed in each client’s ISP “without regard to the availability” of such services. A second proposed change would take away the current requirement that the ISP contain strategies to address the “unmet support needs” of clients. These were key concerns of Judge Tauro’s Disengagement Order — that the ISPs be drafted first and foremost to identify the needs of the client and that the Department then come up with funding strategies to meet those needs. The proposed changes would eliminate that dynamic. In addition, DDS is proposing to change its regulations to take away rights of family members to participate in the ISP process and even to schedule a meeting with a DDS service coordinator to have the ISP explained to them. 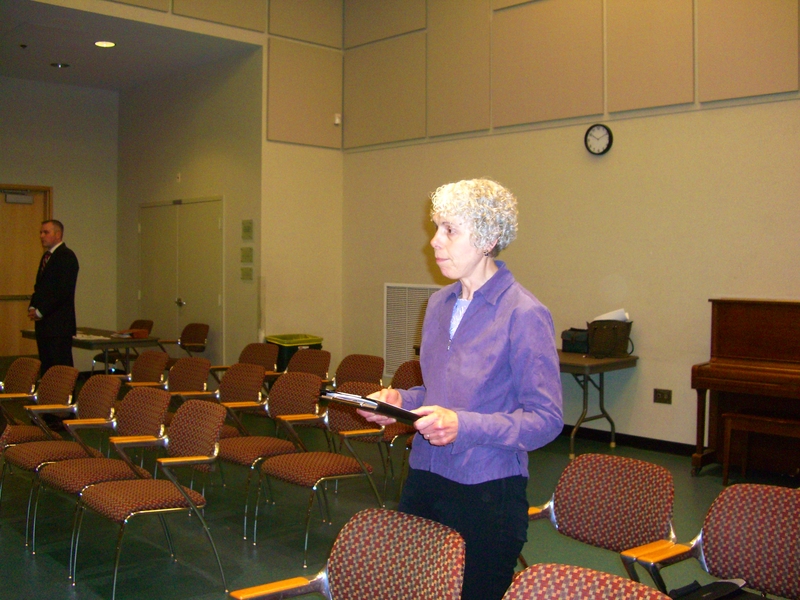 Diane Booher, a Fernald guardian, testifies against proposed DDS regulations changes during a sparsely attended public hearing at the Worcester Public Library on June 15. In our comments submitted to DDS, we added that the proposed changes would also appear to violate a key provision of the federal Developmental Disabilities Assistance and Bill of Rights Act, which states that individuals with developmental disabilities and their families are the “primary decision-makers” regarding the services and supports they receive. On Friday of last week (June 15), DDS held a public hearing on the proposed regulations, which, to my surprise, attracted few attendees. I arrived at the scheduled start of the hearing at the Worcester Public Library at 10 a.m. and was the only person in the audience when DDS Commissioner Elin Howe opened the proceedings. Soon after, two other people arrived to testify — Diane Booher, a Ricci class representative from the Fernald Developmental Center and the guardian of three men who still reside there; and a representative of Vinfen, a major nonprofit operator of group homes in Massachusetts and other states. Booher maintained in her written testimony that “there is no question” that the proposed changes to the regulations would violate Judge Tauro’s Disengagement Order. The Vinfen representative appeared to have some technical issues with the proposed changes, but no major objections — a position I didn’t find surprising. Vinfen and other group home providers will get the same state funding whether the ISPs contain strategies for unmet needs or not. I looked around for someone from the Arc of Massachusetts. Surely, they would be rallying to defend the rights of families and DDS clients? I guess not. At about 10:45 a.m., Commissioner Howe called a recess in the hearing, after the three of us had testified and no one was left to speak. I left shortly after that. If a flood of people arrived anytime after I left and before the scheduled close of the hearing at 3 p.m., I haven’t heard about it. Addition of language giving guardians and individuals the authority to exclude family members from participating in ISP planning and the ISP process. This is particularly concerning to us in cases in which corporations or attorneys are appointed as guardians of individuals and are paid by DDS. Exclusion of family members from the list of persons receiving periodic updates from group home providers regarding the implementation of the ISP. Removal of language stating that families and guardians have a “right” to a meeting with the service coordinator to have the ISP explained to them within 10 days of its receipt. Removal of language requiring the service coordinator to explain ISP appeal rights to individuals, guardians, and family members. Removal of language that a service coordinator must have the approval of the family to waive a meeting to discuss changes to the ISP. Three of the four postponements in the scheduled trial of a former West Springfield group home care worker charged with assaulting an intellectually disabled man were due to separate scheduling mistakes by court personnel, the prosecutor in the case said last week. In a phone call on Thursday, Kerry Whalen, an assistant district attorney in Falmouth District Court, who is prosecuting the case against John Saunders, took responsibility for one of the scheduling mistakes and contended that the court clerk’s office was responsible for two others. We reported that Saunders’ trial had been delayed last week for the fourth time since January, resulting in several fruitless trips from western Massachusetts to the Cape for several prosecution witnesses. Among those witnesses is Sheila Paquette, the sister and co-guardian of the alleged victim, John Burns. Paquette has expressed growing frustration with the delays and had gotten seemingly conflicting answers to her questions about them. The trial has now been scheduled for July 30. Paquette has been pursing the case against Saunders since June 2010, when Saunders allegedly hit Burns in the face while toileting him during an outing on the Cape. Burns suffered two black eyes and other injuries in the alleged assault. Paquette, who is president of the Advocacy Network, a COFAR member organization, personally filed charges against Saunders in July 2010. For nearly two years, Paquette has dealt with a state and court system whose progress in bringing about justice in a case involving a disabled victim has seemed glacial. The case has finally reached the trial stage, but the trial never seems to start. The trial was originally scheduled for January 9, but was postponed until March 27 when Saunders failed to appear on the January 9 date, and then was postponed for the second time until June 4 when a defense witness failed to appear on the March 27 date. It was postponed for the third time until June 5, and for the fourth time until July 30. Whalen said the postponement in March was due to the fact that the defense witness had not been properly notified of the March 27 trial date. She said she personally caused the third postponement in the case when she mistakenly assumed there would be jurors available in the court on June 4th to hear the case. There were no jurors convened that day, requiring a one-day postponement until June 5. Whalen blamed the fourth postponement in the trial until July 30 again on the court clerk’s office, saying that this time the office failed to issue new summonses to witnesses for both the prosecution and the defense with the new June 5 trial date. “The clerk’s office failed to do this (notify the witnesses in that instance). I don’t think it was intentional,” Whalen said. The result was that one witness for the defense and one for the prosecution later said they never received any notice of the new trial date and that they wouldn’t be available that day. I left a message with the court’s clerk magistrate last week to ask if he had a response to Whalen’s account. I haven’t received a call back. Whalen contended it would be impossible to schedule a new trial date earlier than July 30. I asked her if this case will now be treated as a priority on July 30 because three of the four postponements were the result of the court personnel’s own mismanagement; and I asked whether anyone could guarantee that the trial will go forward at that time. Whalen’s response was that the Saunders case “will take precedence over other cases,” but there is no way to guarantee it will go forward in July. Because Saunders is out on bail, she said, his case could be subordinated to another case on July 30 if the defendant in that other case happened to be in custody. That is due to rules limiting the length of time defendants can be kept in custody prior to their trials. Whalen did not apologize for any of the mistakes leading to the postponements of the trial. Sheila Paquette has now traveled from her home in western Massachusetts to Falmouth District Court on Cape Cod three times to testify in an assault trial involving her brother that never seems to start. Today (Tuesday) was the fourth scheduled trial date in the case against John Saunders, who is charged with assaulting Paquette’s brother, John Burns, an intellectually disabled group home resident, while they were on an outing on the Cape in June 2010. Saunders, a care worker at Burns’ residence in West Springfield, was subsequently fired from the job. Paquette said the victim advocate at Falmouth District Court gave her three different reasons for the latest postponement. One was that there was only one judge scheduled to be on duty today to handle all of the cases. The second was that the court was not able to round up a jury for today. And the third was that one witness for the prosecution and one for the defense indicated they would not be available to appear today. Saunders is accused of hitting Burns in the face while toileting him during the June 2010 outing. Burns suffered two black eyes and other injuries in the alleged assault. Paquette, who is president of the Advocacy Network, a COFAR member organization, personally filed charges against Saunders in July 2010. Saunders failed to show up at his first trial date this past January 9. He was reportedly arrested by police a couple of days after the January trial date and was released after posting bond that had been set by a judge at $1,000. Now, that assurance has gone out the window. Paquette is also left wondering why the postponements are so lengthy. “Why did they wait from January until March, and then from March until June, and now from June until the end of July to re-schedule this trial?” Paquette asked. “Why can’t they schedule it for the next court session each time? We had those same questions for the District Court and the District Attorney’s Office. I spoke today to Ed Teague, the clerk magistrate for the Falmouth District Court, who said that while the court schedules jury trials on two days each week, it is not unusual for it to take a month or more to reschedule a trial. Teague said, in fact, that several trials are often scheduled for the same day in the court, and that there are only enough jurors to hold one of those trials per day. Another trial was ongoing today, he said, and for some reason took precedence over the trial scheduled for Saunders. The same thing may well happen on July 30, he acknowledged. Teague said I should ask Cape & Islands District Attorney Michael O’Keefe’s Falmouth Office for the specific reasons for the continual postponements of the Saunders case. However, when I called the D.A.’s office, I was told no one there would speak to me about it.